The following is a list of frequently asked questions on the ISTernship program at IST Austria. What is the ISTernship program? 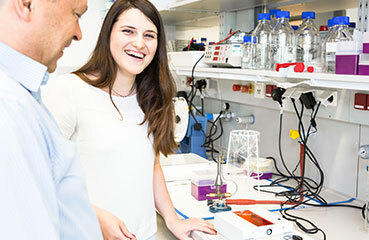 The ISTernship is a summer internship program at IST Austria which offers research opportunities to outstanding undergraduate students interested in biology, computer science, data science, mathematics, physics, neuroscience and interdisciplinary areas. Interns will choose a group to work in, will be assigned a specific project and will conduct research under the close supervision of one of the members of the faculty and, for experimental labs, a lab mentor. Interns will receive an introduction to research at IST Austria as well as an introduction to the IST Austria Graduate School. The program culminates with a research symposium, where the interns present their work to their peers, faculty and lab mentors. Internships are full-time and will be conducted exclusively in English. Candidates must be enrolled Bachelor- or Master of Science students (or similar) in good standing at a degree granting institution. They must have completed at least the fourth semester of their bachelor’s studies (before the respective start date). How long is the ISTernship program? The duration of the ISTernship program is 8–12 weeks between May 15 and September 15. Selected candidates choose the exact length and dates together with the supervisor. No. English is the language used for communication at the Institute. Which projects can I work on? In your application, you need to indicate your preferred professor(s) to work with. The participating faculty will be announced latest when the call opens. Selected candidates will be assigned to a research group and will decide on a project to work on together with their host professor. You do not need to contact the professor(s) during the application phase. The application period for the ISTernship program opens each year around mid-December when a link to an online platform will be published. The deadline for the application is in February. Reference letters are also due by February. More specific information will be published closer to the application period. The application deadline is each year in February. More specific information will be published closer to the application period. The letter of recommendation is a statement where the referee assesses the qualities, characteristics, and capabilities of the applicant in terms of that person’s suitability for the ISTernship. You need to indicate at least one referee in your application. These are people who have taught you or supervised your work and are, therefore, able to evaluate your academic and research performance. Referees are contacted directly with a link to a recommendation form. Your application is complete only if at least one of your referees submits a letter of recommendation. Please be aware that the deadline to submit the letter of recommendation is the same as the application deadline. Therefore, please give your referee(s) enough time to submit the letter. Do I need a language certificate? No language certificates are mandatory for the application. You may upload a language certificate for English if you want to. How and when will I be notified of the results? Notifications to all complete applications will be sent out around mid-March. After receiving an offer to join the ISTernship program, selected candidates will need to accept the offer within about a week. What are my chances of getting accepted to the ISTernship program? The acceptance rate for the ISTernship is normally around 3 %. Is there compensation for ISTerns? All ISTerns receive a monthly scholarship payment as well as access to affordable health insurance and subsidized housing. In addition, ISTerns receive an allowance for their travel costs. How will I receive my monthly scholarship? IST has entered into an agreement with OeAD in order to facilitate administrative matters. After accepting your offer to the ISTernship, you will receive the official scholarship document from OeAD. In case you need a visa for coming to Austria, OeAD will send a confirmation to the respective Austrian representative. OeAD will disburse the monthly scholarship and travel allowance, and arrange an insurance after your arrival if necessary. Note: for visa applications, you will need to take out a travel insurance valid for 10-14 days. For further information, please see www.oead.at/scholars. IST Austria is located just outside of Vienna, Austria. It is a short 25-minute bus ride from Heiligenstadt (end of subway line U4). Vienna is consistently voted one of the best cities in the world to live in. ISTerns have the choice of living on campus, a quiet area with beautiful woods and close to the world-famous monastery (Stift Klosterneuburg), or right in the hustle and bustle of Vienna. How do I get to IST Austria from Vienna? 1. Take the U4 subway (green line) in the direction of Heiligenstadt until the last stop “Heiligenstadt”. 2. Take the IST Shuttle Bus or Bus 400 to the stop “IST Austria”. The trip takes approx. 25 minutes. Housing is available on the IST campus. Space is limited and rooms are booked on a first-come, first-served basis. If you do not get a room or if you prefer to stay in Vienna, mark your interest in the respective field on your scholarship document (sent out by the OeAD) and you will be linked to the OeAD Housing Office which will provide accommodation in Vienna for you. You’re also invited to “like” our Facebook page, or connect via Twitter to stay in the loop about IST Austria and the whereabouts of our scientists! In addition, there is the quarterly newsletter, which is a summary of the highlights of our institute, in a compact quarterly format.